Easily display the blog posts, uploaded images, WooCommerce products, portfolios, events, or any custom post types. Quickly search and filter content by custom taxonomy, custom field, and more. in just minutes, no coding required. Choose from beautifully designed layouts, easily customize them to fit your style with columns, image sizes & styles, overlay, colors & fonts, padding & margin, and more. and other parts of your WordPress site easily. No coding, design skills required! The more content you have on your website, the more difficult and time-consuming to find and display the best content to your visitors. Content Views Pro helps you to find and display your best content quickly and easily, using the easy-to-use admin panel. You can find your content by many criteria: taxonomy, custom field, date, author, status, keyword. Each of them has their own settings to help you tailor your results. It is crucial for e-commerce, listing or any sites to help customers to find their desired content quickly with ease. 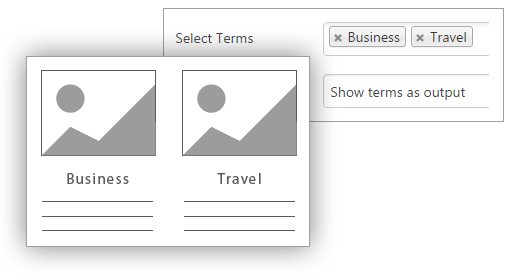 Content Views Pro helps you to display custom filters to your visitors, allow them to find what they want quickly and easily. 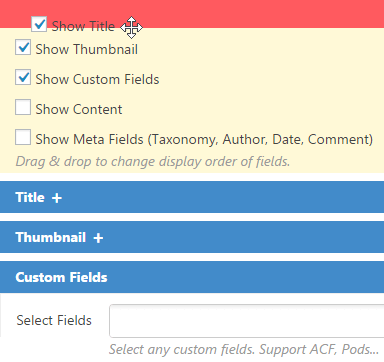 You can show any WordPress categories, tags, custom taxonomies, custom fields as filters. 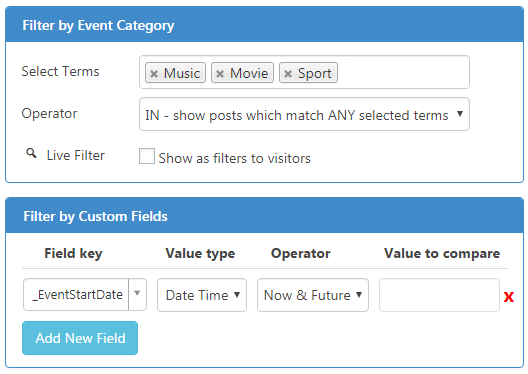 Each filter can be displayed as a checkbox, dropdown, radio button, range slider, date range. You have complete control to show or hide any information, to change the display order of information by drag & drop. Thumbnail: you can show the featured image or the first image/video/audio in the post content. You can use an existing size or set a new image size. You can select thumbnail style (round edge, border, circle, shadow). Content: you can show the full content, the generated excerpt, or the manual excerpt (in the Excerpt field of post). There are unlimited color, hundreds of font families, font-size, text-align, text-transform, etc. to design the layout easily. You can leverage it. You can earn from it. Is your Blog page showing posts in a long & boring list? How to create a beautiful grid for your Blog page? With Content Views Pro, the valuable Replacing Layout feature will help you to create a beautiful grid of posts for the Blog, Category, … pages in just minutes, no coding required. It saves you a lot of time and money. Content Views Pro helps you to make money from your website, by displaying Google Adsense, affiliate banners, etc. between the posts. You can display advertisements in the grid randomly or in fixed positions. 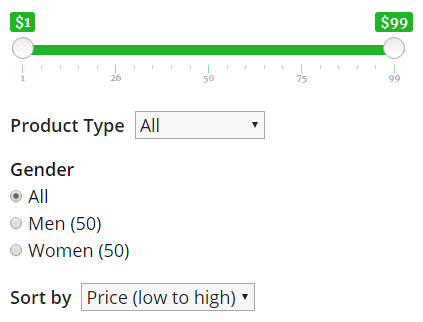 If you use pagination, you can set the number of advertisements per page easily. Do you want to show some featured categories to visitors? Content Views Pro will help you to show any category, tag or custom taxonomy in output, with built-in option, without any line of code. Genesis, Divi, Thesis, WooThemes, ThemeForest or any theme, in any WordPress single site and multisite network. Thoroughly tested and optimized for best performance. Content Views Pro performs speedily on all sites, from large to small. Live preview, straightforward settings, no code template or syntax involved. It requires no time to learn, no coding skill. Simply install and enjoy. Content Views Pro is extremely extensible with plenty of hooks to modify query and output. For Arabic, Persian, Hebrew, etc. languages, you can select the “right-to-left” option for text direction, without any custom CSS. Content Views Pro is ready to be translated into your language. If you need assistance, we’re here to help with forum, email support. Content Views Pro integrates flawlessly with popular WordPress custom post, custom field, membership, translation and builder plugins. I don’t like to pay for plugins. Normally I don’t. But this was just too good, and saved me a lot of time. Surprisingly lightweight, functions beautifully. Changed the layout of my blog to blocks, and the layout of the shop to a masonry grid with no pain or much effort whatsoever. This was the best value for my $$ ever on WordPress. Content Views Pro cuts the number of plugins we need in half and reduces the amount of code. Before I started using Content Views Pro, I spent a lot of time creating code to create dynamic web pages. Now I can do it without a single bit of code. Content Views Pro offers a fleet of convenient features without inconveniencing you in other ways. Anyone can use it. This was about the 5th grid plugin I had tried due to the others either not quite working well enough or conflicting with my other plugins. This plugin worked well straight away. The support was fantastic and very quick. Very good indeed and highly recommended. I am currently upgrading all the grids on my site to Content Views Pro. Have used this for almost 4 years now, and cannot do without it! Pro version works with Events Manager and similar products seamlessly to allow alternative presentation of contents on my websites. Support has always been very quick and responsive. Absolutely brilliant thank you. For the cost of the product, you are a dream. 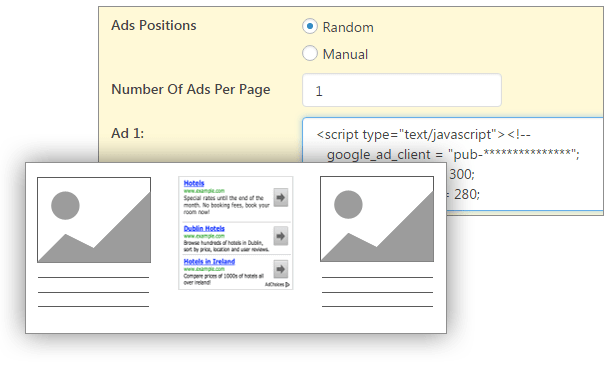 I highly recommend this plugin to display lists or grids of posts based on Categories, Tags, Posts, Pages, etc. It’s very easy to install and set-up, and the UI is logical. You can display your content quickly with your choice of thumbnail sizes, titles, captions, any metadata you want, style it, etc. This is the best plugin in its type, which delivers the most features in the most elegant way for the price offered. I compared several plugins for listing my posts in different arrangements, and this plugin had the features I was looking for. The support, updating, and features are excellent. 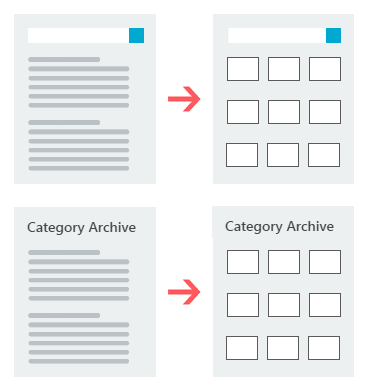 The pro version also includes helpful documentation for customizations like using views on your archive, search, and blog pages. After getting the pro version for one site, I soon got the Pro version for a second site as well. You not only made an excellent plugin but your level of dedication to anybody who uses it – puts you aside among many other plugin authors. I’ve seen how you try to be quick and help everyone in WordPress forum. That is why I purchased Content Views Pro without hesitation. Content Views Pro is one of the best plugins I’ve used. A very useful and customizable plugin! Easy styling to suit my theme. Support has been second-to-none. Not generic cut and paste answers but human brain generated and tailored to your specific needs. Very refreshing to find support which still has a personal and very helpful touch. Well done the Content Views Pro team! This plugin works like a dream. Easy to use, terrific styling, great features. I can’t even believe how much it has improved my site in a very short time and allowed me to separate and display my content in interesting ways. Exactly what I was looking for. Started with the free version and immediately saw that what it can do. It is reasonably priced and really fantastic. Thank you! Great plugin, really easy to configure and looks beautiful on my landing page. This is exactly the plugin that I was looking for. Also the Pro version is really worth the investment. And the support is top-notch, not only responded to all of my questions quickly but also provided me with helpful answers and solutions. Thank you for everything! Outstanding customer service, friendly folks and great looking plugin. I’d recommend this to all. Solid, pretty much bulletproof, and it works without fiddling. And the support is outstanding for the Pro version. I need solution for a project that needs grid layout with various options implemented on pages. Thankfully, I came across Content Views Pro. 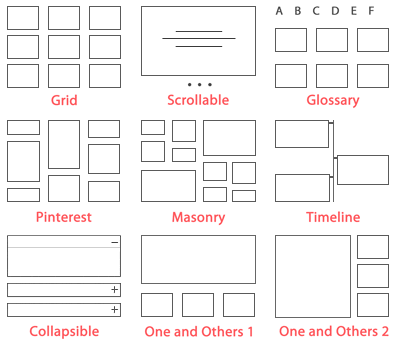 It is all in one – great and very user-friendly usage that helps me to create ultimate grids. One of the best and most useful plugins I have come across! Please don’t ever discontinue this plugin – by far the most convenient plugin I’ve found for displaying posts in desired formats (which is the backbone of many sites). I’ve bought it for 3 different sites now. Thanks and keep up the GREAT work. Just purchased this for our e-learning site. Excellent support received from plugin owner as well. Highly recommended! Super useful plugin. Works perfectly. Easy interface. Purchase with confidence – see our refund policy.